Can Make In No Time! Do you want to make a gift, but seem to be short in the time department? Don't despair! We've got easy ideas for quick gifts, as well as for those hard-to-buy-for people. Consider making a food gift. And why not? Everyone eats, so everyone likes food! Even if you're not a great cook, there are still lots of wonderful food gifts that you can make and give, with little to no kitchen skills required (honest). If you have recipients with special dietary restrictions, or just want to make healthier gifts, check out these cooking tips! 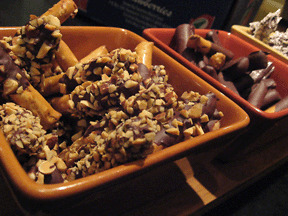 Chocolate Pretzels Sticks by E.T. "Gourmet" Chocolate Goodies - I don't know a lot of people who don't like chocolate, and in under an hour, you can make a real crowd-pleaser that's perfect for any gift-giving occasion! Or, make a personalized giant candy bar. Buy a big candy bar and replace the outer wrapper with your own custom wrapper. You can print one of the many free chocolate bar wrapper designs found on the internet, some of which even have places for you to put a photo and your own words. Or, make it yourself by tracing the original wrapper and cutting it out from nice gift paper. Then just tape or glue in place. Homemade jar recipes, or Gifts In A Jar, are a thoughtful and economical way to treat friends, coworkers, neighbors or teachers to the flavors of the season. Making these quick gifts is easy and fun - and you can even get the kids involved! They don't require a lot of creativity or crafty know-how. If you can measure a few ingredients into a jar and tie a ribbon, you're good to go! Do you have a signature recipe for sauce, marinade, or spice rub that you get compliments on? Well bottle it up! It's easy to increase your recipe so that you will be able to make enough for everyone on your list. Don't limit yourself to savory items - desert sauces, like caramel or fudge, make great quick gifts as well! Infused Oils and Vinegars look stunning and are deceptively simple to make. 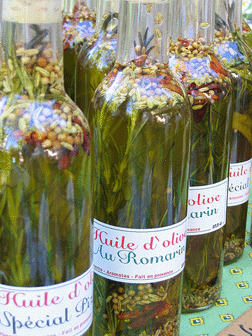 Flavored Oils can be used as a dressing, for dipping bread, or cooking. Infused vinegars make wonderful salad dressings when mixed with an oil, or make tender, juicy meat when used as a marinade. Stored in an attractive bottle, these can be as pretty as they are practical. Mini books make wonderful quick gifts for just about anyone! Using inexpensive 4x6 photo albums, you can make a mini scrapbook with your favorite photos, or copy your favorite recipes for a custom cookbook! Scan your pages into the computer and you'll be able to quickly and easily make more copies for anyone else on the list! Photo/Digital Art gifts are quick, easy, and fun! With a computer and a good printer you can turn out lots of cool items that are truly unique and personalized. Not the crafty sort? There are many companies that allow you to put your favorite picture onto one of their products. You can find almost anything, such as mugs, mouse pads, magnets, t-shirts, jewelry, buttons, posters, many of which are quite inexpensive. Remember, it takes only minutes to upload your photo and order this type of gift, but be aware of processing and/or shipping times (which can sometimes take in excess of two weeks). Candles are a popular choice - with their wonderful aromas and the romance of candlelight, they are a gift anyone would love. There are many ways of making candles; they can be molded, fused, layered etc. Container candles are the quickest and easiest, and you can really get creative with what type of container you use to make something truly unique. Creating your own bath and body products, like body scrubs, bath salts, facial masks and more is easy to do, and healthy for the skin. You don't need any special equipment to get started and, in many cases, a bowl and some measuring devices will suffice. The most important thing you need are quality products and great recipes for a present that pampers! 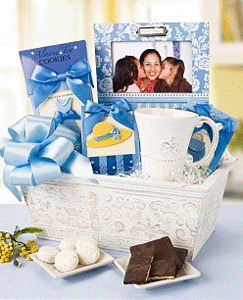 Creating your own gift baskets is really easy and fun! They can be packaged to suit any style and budget and make ideal presents for friends, family and colleagues or business associates. Whether the components are handmade or puchased, the recipient will appreciate the effort and time you have spent to make such a special gift. Even if you're short on time, or not the artsy-craftsy type, you can still make a homemade gift. Handmade items do take time, but most of these quick gifts can be made in less time than it takes for you to go to the mall and buy something. Homemade gifts come from the heart, and your recipient will appreciate the time you've spent creating a unique gift. Some wonderful craft ideas for Mom can be found at Mom's Holiday Craft Ideas. There are fun craft ideas and printable instructions for other holidays there too! Looking for something the kids can do? Family Fun Cartoons is a great site filled with craft ideas, coloring pages, and funny stuff for the whole family!